The surveyed models suggest that sea surface temperatures in the key ENSO region of the tropical Pacific Ocean are likely to remain around El Niño thresholds for the next few months. By late winter, three of the eight surveyed models indicate temperatures will cool, returning to neutral levels, and by September five models indicate a return to neutral. However, the model outlooks only encompass the oceanic component of El Niño. For an El Niño event to be considered in progress, both the tropical Pacific Ocean and atmosphere need to be reinforcing each other for several weeks. While sea surface temperatures have been close to El Niño thresholds since late February, a persistent signal in the atmosphere has yet to be observed. The Indian Ocean Dipole (IOD) is likely to stay neutral for the remainder of autumn. Some models show a tendency towards positive values during winter 2019 which can have a drying influence on parts of central, southern and eastern Australia. The IOD typically has little influence on Australian climate from December to April. The latest weekly NINO3.4 value (to 14 April) is +0.8 °C, the seventh consecutive week at El Niño thresholds in the central tropical Pacific Ocean. Five of the eight surveyed models suggest the central tropical Pacific (NINO3.4) will remain at or above El Niño thresholds up to and including July but by September, only three models just exceed the threshold. It should be noted that model accuracy when forecasting through the autumn months is lower than at other times of the year. Persistent NINO3.4 values above +0.8 °C typically indicate El Niño, while values below −0.8 °C typically indicate La Niña. The Indian Ocean Dipole (IOD) is currently neutral. The latest weekly index value to 14 April is 0.0 °C. All models suggest IOD index values are likely to remain neutral for the coming months, but may tend positive heading into spring. A positive IOD typically has a drying influence on parts of southern and central Australia during spring. IOD events are typically unable to form between December and April. This is because the monsoon trough shifts south over the tropical Indian Ocean, changing wind patterns and preventing the IOD pattern from being able to form. The IOD has little effect on Australian climate at this time of year. The Bureau of Meteorology's climate model generates a six-month forecast for the NINO and IOD indices each fortnight. The most recent model run (generated 13 April) suggests the central tropical Pacific will persist above the El Niño threshold for the reaminder of autumn and early winter, but return to neutral values in late winter. For the Indian Ocean Dipole (IOD), the Bureau's model suggests neutral IOD values throughout the autumn and winter months but there is a large spread in the ensemble (meaning greater uncertainty) towards the latter part of the outlook period. The forecast values, shown below in bold, are for the model's ensemble mean. Australian climate is influenced by temperature patterns in the Pacific and Indian Oceans. This page provides information on Pacific and Indian Ocean outlooks for the coming six months based on a survey of international climate models. Graphs representing the description above. Based on the ensemble mean for the most recent model run. The arrows on the dials indicate the combined average of monthly outlooks from a survey of international global climate models. Note that the individual model runs vary around the average. NINO3.4 covers the central Pacific region. The graphs are based on the ensemble mean for the most recent model run. These graphs show the average forecast value of NINO3.4 for each international model surveyed for the selected calendar month. If the bars on the graph are approaching or exceeding the blue dashed line, there is an increased risk of La Niña. Similarly, if the bars on the graph are approaching or exceeding the red dashed line, there is an increased chance of El Niño. 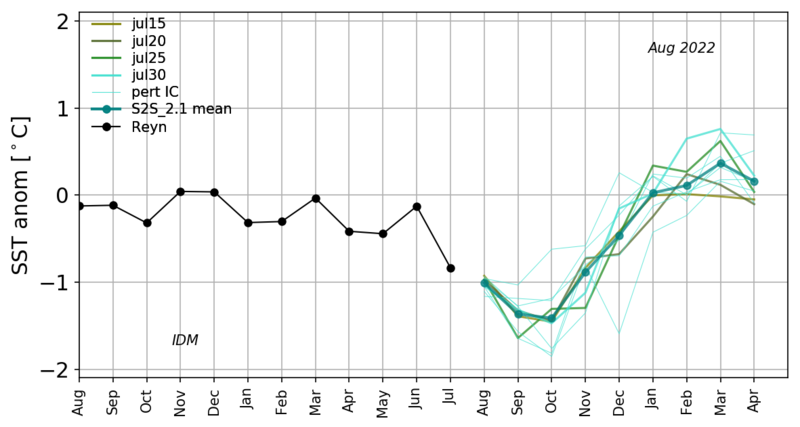 Thse graphs show the average forecast value of the IOD index for each international model surveyed for the selected calendar month. If the majority of models are approaching or exceeding the blue dashed line, then there is an increased risk of a negative IOD event. If the majority of models are approaching or exceeding the red dashed line, then there is an increased risk of a positive IOD event. Australian climate is influenced by sea surface temperature patterns in the Pacific and Indian oceans. Specific regions are monitored, as they can indicate the presence, or potential development, of ENSO (El Niño/La Niña) and Indian Ocean Dipole (IOD) events. NINO34 predictions for the next 5 months. The plume graphs show outlook scenarios for sea surface temperatures (SSTs) averaged over particular regions of the Pacific and Indian oceans. The SSTs in these regions are related to different phases of the El Niño-Southern Oscillation (ENSO) and the Indian Ocean Dipole (IOD); climate drivers that can influence Australian rainfall and temperature patterns. The graphs show 99 possible scenarios (grey lines), that are produced by the Bureau's climate outlook model, which represent the range of outcomes that may occur over the forecast period. For example, they may show the SSTs in the NINO3.4 region to be warming, cooling, or remaining mostly steady. At times the outlook might suggest a shift towards (or away from) values typically associated with El Niño or La Niña events. Each of the 99 scenarios is based on current conditions in the global oceans/atmosphere and how the model anticipates their likely development over the outlook period, with each given slightly different treatment to provide a range of likely possibilities. This technique allows us to see the range of what is possible, with a small spread in the range of scenarios meaning more confidence in the likely path, and a larger spread meaning less confidence. The green line is the average of all these 99 scenarios, often known as the ensemble mean. The solid black line shows the observations (based on the Bureau's SST observation analysis for each region) for the previous months. The graphs are updated fortnightly. As a result, the value given for the 'current month' can vary depending on at what point in the month the forecast is being issued. Forecasts made on the 1st to the 11th of the month show a forecast value for the current month. 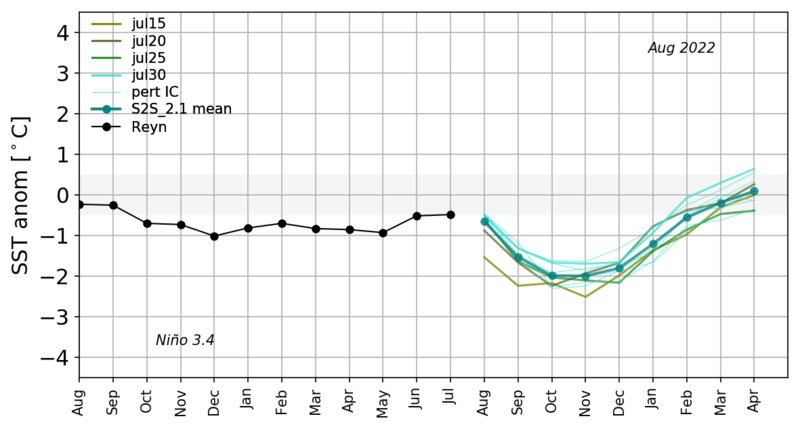 For forecasts made after the 11th of the month, a month-to-date observation (shown by an open circle and dashed line), based on weekly observational data, will be used for the current month as a preliminary value until the final monthly data is available. These plume graphs and data are also included in the Bureau's ENSO Wrap-Up and Model Summary webpages. While the climate model runs a set of 99 possible scenarios, it can be useful to look at the ensemble mean (the average of these forecasts) to see the most likely scenario. The global SST maps show the most likely SST anomaly for the months and seasons ahead. This can be useful to see how ENSO and IOD look spatially. The SST anomalies show the difference from the 1990-2012 average (often referred to as the base period). The long-range SST outlooks are generated by the Bureau's climate model, ACCESS–S (Australian Community Climate Earth-System Simulator–Seasonal). ACCESS–S is the Bureau of Meteorology's dynamical (physics-based) weather and climate model used for monthly, seasonal and longer-lead climate outlooks. Prior to August 2018, climate outlooks (including these graphs) were produced by the Bureau's earlier model, POAMA. The models used within our survey are listed below with links to their agency homepages, model output and technical information about the model. This webpage surveys the latest output from several reputable climate models developed at leading international climate agencies. Data from these models is analysed and displayed in graphs and dials to show how temperature patterns in the Indian and Pacific ocean are likely to change over the coming six-months. These patterns in the oceans have been shown to have a significant impact on Australian temperature and rainfall patterns (e.g. cooling of the tropical Pacific Ocean during La Niña events is typically associated with increased rainfall and cooler daytime temperatures in Australia). When the models are in agreement, then there is higher confidence in the model outlooks. When the models are showing a large spread or large variety of outcomes, there is a larger amount of uncertainty associated with the forecast. All the models included in this page have been documented in the peer-reviewed international scientific literature and have skill in predicting El Niño-Southern Oscillation (ENSO) and Indian Ocean patterns. They are all coupled General Circulation Models, and hence simulate both atmospheric and oceanic processes using physics rather than statistics. Most have been run routinely for a number of years and are subject to regular revision and update with the aim of continuous improvement. They represent the state-of-the-art of climate prediction systems and offer useful guidance up to about nine months. The majority of models used in our survey are formally recognised by the World Meteorological Organization as Global Producing Centres for long-range forecasts. The Climate Model Summary is updated on the 16th of each month (or the next working day following the 16th) when model data becomes available. Data for the Bureau's model, ACCESS–S, is updated fortnightly along with several other models that also provide more frequent updates during the month. All models use an ensemble method, where several forecasts are run at the same time using slightly different initial conditions. While all models use ensemble techniques, the number of ensembles differs for each model. The data presented on these pages is the 'ensemble mean' which is the average of all the model-runs performed by each model, each month. The ensemble mean therefore flattens out the potential forecast outcomes and doesn't show the full spread of the possible forecast scenarios. The ENSO and IOD dials (from the Overview section) are calculated by simply averaging the ensemble means from all the models surveyed. Values are not representative of the potential spread of the forecast outcomes. Therefore, the dials are intended to be used as a quick reference to determine whether the models are showing a warming trend, a cooling trend, or neither. More information is provided in the graphs presented in other sections. Model data are provided for Bureau of Meteorology use by the agencies detailed in the Models section. Respective agency copyright applies to these data.